This entry was posted in email, Social Network Analysis and tagged email, Microsoft Exchange Server, Social Network Analysis on June 4, 2013 by Robert Gimeno. Is 1.66 the cosmological constant of Email? The average across the entire period is 1.66. The only noticeable variation occurs during the Christmas holiday when the organisation is almost completely closed. 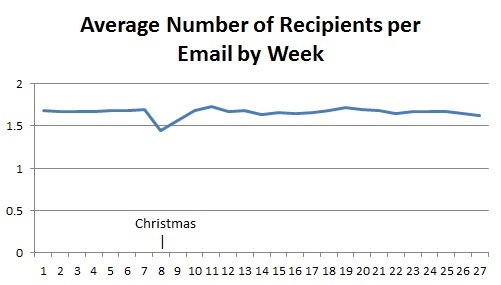 That last one, which effectively shows the average size of emails, is interesting in that there is a peak immediately following the end of the Christmas holiday; this could be interpreted as a build-up of information suddenly being released or it could be because there is a lot of ‘set-up’ information sent around at the beginning of the year. This entry was posted in email, Social Network Analysis and tagged email, Microsoft Exchange Server, Social Network Analysis on May 21, 2013 by Robert Gimeno. 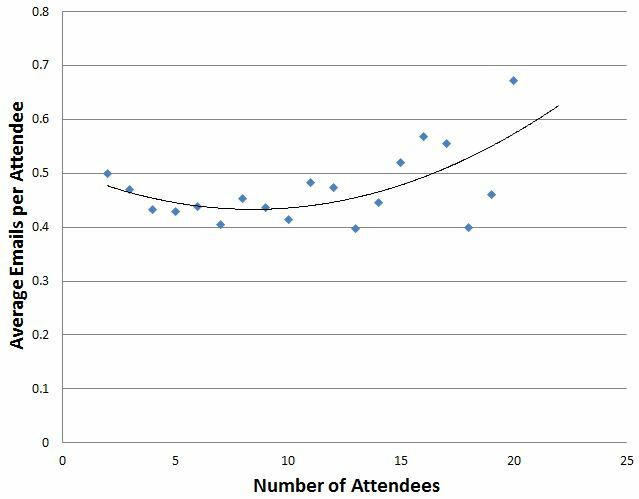 Seems to suggest the larger the meeting the less attention people are paying but not a particularly remarkable result. I expect looking at instant message traffic during meetings would be more revealing. This entry was posted in email, Social Network Analysis and tagged Dunbar's Number, email, Meetings, Microsoft Exchange Server, Social Network Analysis on March 20, 2013 by Robert Gimeno. The next data source you may have in your organisation also comes from Microsoft Exchange Server. If you use Exchange Server to book meeting rooms then this can be mined. As always what can be accessed will depend on your organisations privacy policies. In the organisation I describe here I have access to the calendars for well over half of the meeting rooms using my standard authentication credentials because I am allowed to book meetings in these rooms. Through the room calendar I can also see when other people have booked meetings; it’s not possible to see the meeting subject but it is possible to see a list of attendees. Unlike email I have accessed the meeting room calendars through the Exchange Server API; this is described by a number of others so I won’t reproduce it here, search for ‘Microsoft.Exchange.WebServices’ and ‘GetRoomLists’. Meetings differ from email in that they are a many-to-many event rather than on-to-many. There will be a meeting organiser but this is often a PA so I do not give any special meaning to them. Just as with email I prefer to load data into a relational database first, the table structure is shown, below. I found an interesting discussion of Dunbar’s Number in ‘Connected: The Amazing Power of Social Networks’ by Nicholas Christakis which suggests the maximum effective meeting size is 3.8 (OK let’s call it 4) which seems to support the fairly rapid degradation of the importance of a meeting (as a social network building tool) when the number of attendees increases. If you check out the book at Amazon http://www.amazon.co.uk/dp/0007303602/ and look at the preview you’ll see the discussion on page 249. This entry was posted in Social Network Analysis and tagged Meetings, Microsoft Exchange Server, Social Network Analysis on March 19, 2013 by Robert Gimeno. This entry was posted in email, Social Network Analysis and tagged email, Microsoft Exchange Server on March 18, 2013 by Robert Gimeno. Always turn email addresses into a consistent case; I prefer lower but the choice is yours. Oh and get rid of any leading or training spaces, you shouldn’t get any from the Exchange message tracking logs but make sure by trimming anyway. 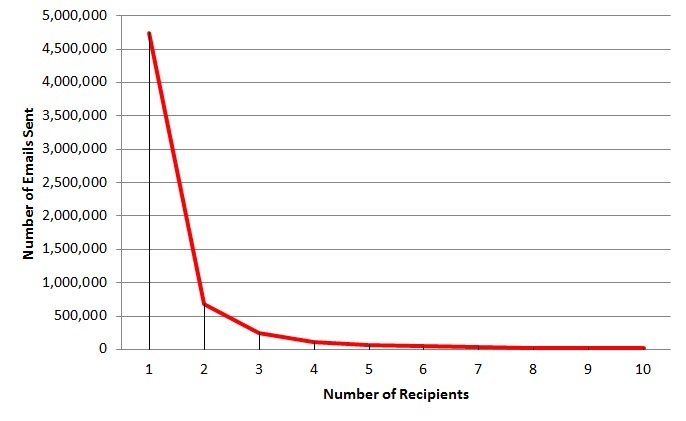 Use a formula to exponentially reduce the social network significance assigned to an email as the number of recipients increases. I’ll say more about this approach when I discuss some other sources of data. Ignoring system/technical accounts: you might see emails sent from non-personal accounts, e.g. “hr@domain.com” and these should probably be ignored as they are usually just a broadcast of information revealing no social ties. How do you spot them? If you are lucky then they may not conform to the same pattern as personal emails (e.g. “firstname.surname@domain .com” versus “hr@domain.com”) or you’ll have to construct a list; in my experience both were used, the pattern match caught most but there were a number of exceptions that had to go into a list, you just have to keep an eye out for them. 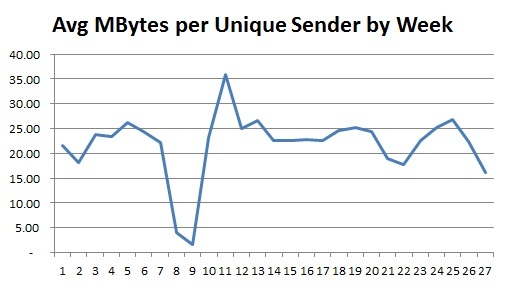 The Exchange server logs contain a message size. I have not yet found any use for this in understanding the social network but it’s useful to have when making friends with the Exchange server administrator, see my next article! This entry was posted in email, Social Network Analysis and tagged email, Microsoft Exchange Server, Social Network Analysis on March 15, 2013 by Robert Gimeno. Before doing anything with the message subject turn the whole string into consistent case (upper or lower, your choice) otherwise “Hello” and “hello” give different hash values. Strip of the subject prefix (“RE:”, “FW:”) and do this repeatedly until none are left. Store the outermost prefix as-is (no hashing) and then hash and store the remainder of the message subject. In Social (Organisational) Network Analysis using email – Practical Architecture Part 1 the email table contains the fields ‘subject_prefix’ and ‘subject_hash’ – this is what these fields store. Base64 encode the hashed value otherwise you’ll run into trouble with escape characters. This entry was posted in email, Social Network Analysis and tagged email, Microsoft Exchange Server, privacy, Social Network Analysis on March 12, 2013 by Robert Gimeno. Node XL (remember good for small sets of data, < 1000): if you are using .NET then it’s very simple to drop the NodeXL control onto a Windows form and get a reference to the underlying object model. Then whip through the nodes (or vertices as NodeXL calls them) and add them followed by the Edges; for each Edge you need to get the Node IDs which just requires a quick lookup directly from the NodeXL model. Gephi (can handle larger sets, easily 10,000 nodes): my favourite approach is to write out a .GEXF file following very much the method above but there is no need to look-up any internal references for the Edges, you just need the two Node IDs. Neo4j (can handle larger sets, easily 10,000 nodes): if you are writing in Java then I believe it’s possible to directly manipulate the object model (very much like you can with .NET and NodeXL) but I used the REST API which is definitely fast enough when running on the same computer. There are some .NET libraries available the wrap the REST API but the level of maturity varies. I have found a problem specific to Neo4j, which is it wants to create its own node IDs which can’t be changed. When you create a new Node Neo4j returns the ID which you will need when adding the Edges, so I suggest recording these in a hash-table to map them to the Node ID from the relational database otherwise you will need to query Neo4j to get the IDs every time you add an Edge. 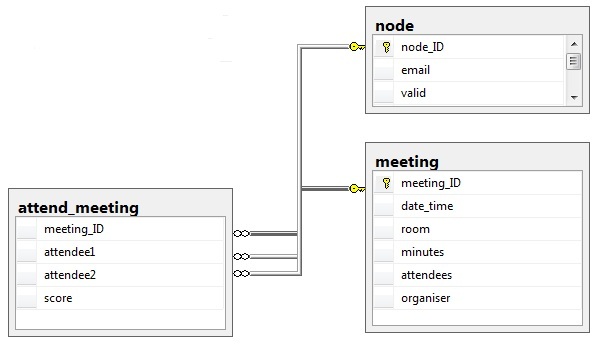 I hope this has given an overview of how to get email logs into a graph-aware database or application by using and ETL step to first store an intermediate relational database and a second ETL step to move from a relational to graph structure. Keep an eye out for future postings that I intend to drill into some of the detail and expansion of the architecture described here. This entry was posted in email, Social Network Analysis and tagged Architecture, email, Microsoft Exchange Server, Social Network Analysis on March 11, 2013 by Robert Gimeno. If you want to study an organisation email is a rich source, but what have we learnt about the architecture of a solution that allows this analysis to be conducted? First let me caveat the solution I’ll describe: it was built for an enterprise that manages all of its own email with approximately 2000 users (nodes); now this is part of a larger organisation where we have some interest in connections between the enterprise and larger organisation, for this analysis there are approximately 10,000 nodes; if all emails available are included (including those from outside the larger organisation) then there are approximately 100,000 nodes, we have not performed analysis at this scale. Not all technologies suit all scales of analysis (for example NodeXL is really only effective on graphs with under 2000 nodes) so please bear this in mind for your own domain. Step 1: Getting hold of the email: our example organisation uses Microsoft Exchange Server which allows the administrator to enable Message Tracking logs; these logs include the sender and recipient list for each email, the date and time is was sent and some other pieces of information. The logs will never include the content of the message but can be configured to include the subject of the message. Depending on your organisations security and/or privacy policies this could be contentious but useful if you can obtain it; I’ll be posting a follow-up entitled “Dealing with Sensitive Data” which describes how the message subject can be used whilst maintaining privacy. 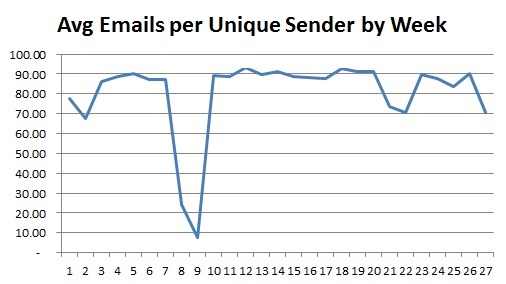 • “email” table: 1 row per email with an integer email ID, the ‘node’ ID of the sender, the date and time. Step 3: Extract from Email Logs, Transform and Load into the relational database: Firstly you’ll want to open and read each email log-file; the Exchange message tracking logs repeat the information we are concerned with several times as they record he progress of each message at a number of points. I found the best way to get at the data I wanted was to find a line that contained an event-id of “RECEIVE” and source-context is not “Journaling” (you may not have Journaling in your files but probably worth excluding in case it gets enabled one day). The rest is pretty simple: create a “node” record for the sender-address if one does not already exist, create a new “email” record (the sender_ID is the “node” record just created/found) and then for each address in recipient-address create a “recipient” record using the email ID just created and then a new or existing “node” ID for each recipient. Email logs can add-up to a lot of data so I’d advise loading them incrementally rather than clearing down the database and re-loading every time you get a new batch. This requires you consider how to take account of existing node records: you could do this with a bit of stored procedure logic but my approach was to load all the existing nodes into an in-memory hash-table and keep track that way. In part 2 I’ll explore how to get the relational representation into a graph. This entry was posted in email, Social Network Analysis and tagged Architecture, email, Microsoft Exchange Server, Social Network Analysis on March 10, 2013 by Robert Gimeno.